Sand Lake Imaging, a radiology practice based in Orlando, Fla, decided to partner with CoActiv on the company’s full suite of medical imaging solutions. These solutions include the company’s EXAM-PACS with 3D diagnostic viewing for DICOM image management, EXAM-SENDER and EXAM-BROWSER for image distribution, and EXAM-CLOUD vendor-neutral cloud-based extended archiving and disaster recovery. CoActiv’s EXAM-BROWSER is a zero-footprint, universal clinical viewer for quick and secure viewing by referring physicians. “The ability to save measurements and other data on the images allows for rapid data accumulation and ease of data quantifcation with respect to evaluating results. Outcomes-driven results data are easily quantifiable with the tools provided by CoActiv, especially with the user-friendly ability to maintain annotated images,” said Steven Bravo, MD, medical director of Sand Lake Imaging, which has extensive involvement in clinical trials and 70 years of combined specialized experience in MR, CT, and mammography. Following a thorough vetting of vendors, Sand Lake Imaging—which prides itself on the fact that its radiologists are on-site at all times to monitor procedures and consult with physicians and other medical staff—chose to partner with CoActiv in great part because of the priority the practice places on communicating with referring physicians. CoActiv also is helping the practice with automated support for electronic health record (EHR) integration, which assists the practice in meeting Meaningful Use criteria, according to Bravo. CoActiv is doing this by facilitating “an easy HL7 interface with our RIS system, which allows for bidirectional integration with referring doctors’ EHRs,” he said. “With the new browser, multiple users can now review an image simultaneously, collaborate, and offer second opinions as needed—with no preplanning. This steps up the speed and quality of patient care, with a broader range of experts able to confer on a case in less time,” said Ed Heere, president and CEO of CoActiv. According to the company, CoActiv leads the field as one of the first PACS solutions to offer 3D imaging—at a time when 3D imaging is growing in importance. 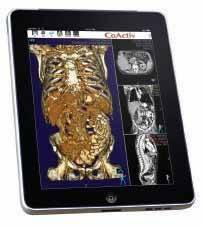 On-the-go physicians can access EXAM-BROWSER via CoActiv’s EXAM-PACS — and most other PACS products—on a variety of platforms and mobile devices, including the iPhone, iPad, Kindle Fire, and Android phones. The company notes that EXAM-PACS also provides support for viewing and archiving Hologic’s new C-View 3D/2D tomosynthesis images. Here’s how that works: C-View automatically extracts 2D breast images from 3D renderings, eliminating the need for a second exam, which can have a significant impact on radiation exposure. The company says that EXAM-PACS can archive both representations in the same patient file for instant review. In order to respond to the increased need for cloud-based digital imaging, the company also announced expanded service and pricing options for its new EXAM-CLOUD/EXAM-VAULT extended time archiving. “CoActiv is committed to offering options that support every site’s workflow and budget to ensure that all customers can enjoy the benefits of a cloud solution that’s right for their practice,” said Heere.